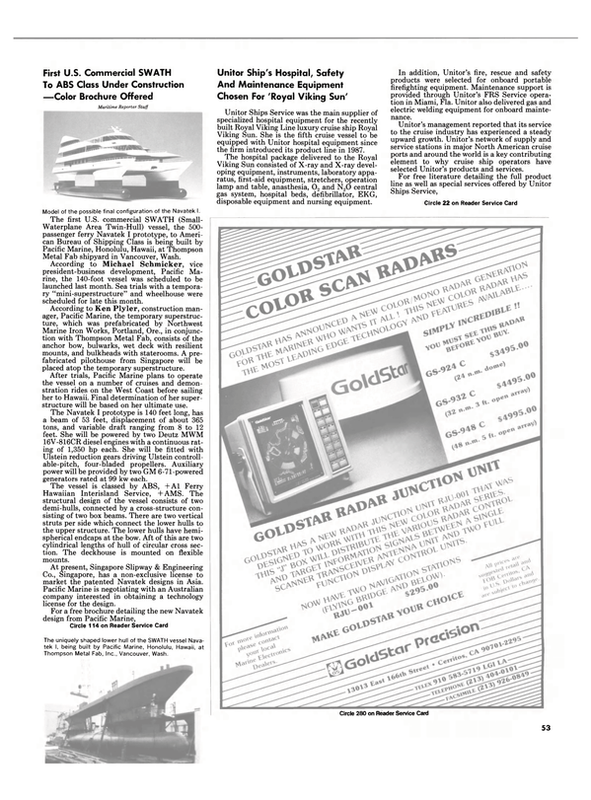 —Color Brochure Offered The first U.S. commercial SWATH (Small- Waterplane Area Twin-Hull) vessel, the 500- passenger ferry Navatek I prototype, to American Bureau of Shipping Class is being built by Pacific Marine, Honolulu, Hawaii, at Thompson Metal Fab shipyard in Vancouver, Wash. According to Michael Schmicker, vice president-business development, Pacific Marine, the 140-foot vessel was scheduled to be launched last month. Sea trials with a temporary "mini-superstructure" and wheelhouse were scheduled for late this month. According to Ken Plyler, construction manager, Pacific Marine, the temporary superstructure, which was prefabricated by Northwest Marine Iron Works, Portland, Ore., in conjunction with Thompson Metal Fab, consists of the anchor bow, bulwarks, wet deck with resilient mounts, and bulkheads with staterooms. A prefabricated pilothouse from Singapore will be placed atop the temporary superstructure. After trials, Pacific Marine plans to operate the vessel on a number of cruises and demonstration rides on the West Coast before sailing her to Hawaii. Final determination of her superstructure will be based on her ultimate use. The Navatek I prototype is 140 feet long, has a beam of 53 feet, displacement of about 365 tons, and variable draft ranging from 8 to 12 feet. She will be powered by two Deutz MWM 16V-816CR diesel engines with a continuous rating of 1,350 hp each. She will be fitted with Ulstein reduction gears driving Ulstein controllable- pitch, four-bladed propellers. Auxiliary power will be provided by two GM 6-71-powered generators rated at 99 kw each. The vessel is classed by ABS, +A1 Ferry Hawaiian Interisland Service, +AMS. The structural design of the vessel consists of two demi-hulls, connected by a cross-structure consisting of two box beams. There are two vertical struts per side which connect the lower hulls to the upper structure. The lower hulls have hemispherical endcaps at the bow. Aft of this are two cylindrical lengths of hull of circular cross section. The deckhouse is mounted on flexible mounts. At present, Singapore Slipway & Engineering Co., Singapore, has a non-exclusive license to market the patented Navatek designs in Asia.